​Lovely, natural results achieved here on a brunette & blonde client :) Both still had some of their own brow hair but their brows were patchy and lacked shape & definition. By re-drawing on the shape & carefully filling in the gaps with hairstrokes & some shading, I was able to achieve a very realistic look for them both which they were really happy with. Once healed, they will save SO much time pencilling in their brows and can go out each day, knowing there's one less thing to worry about! 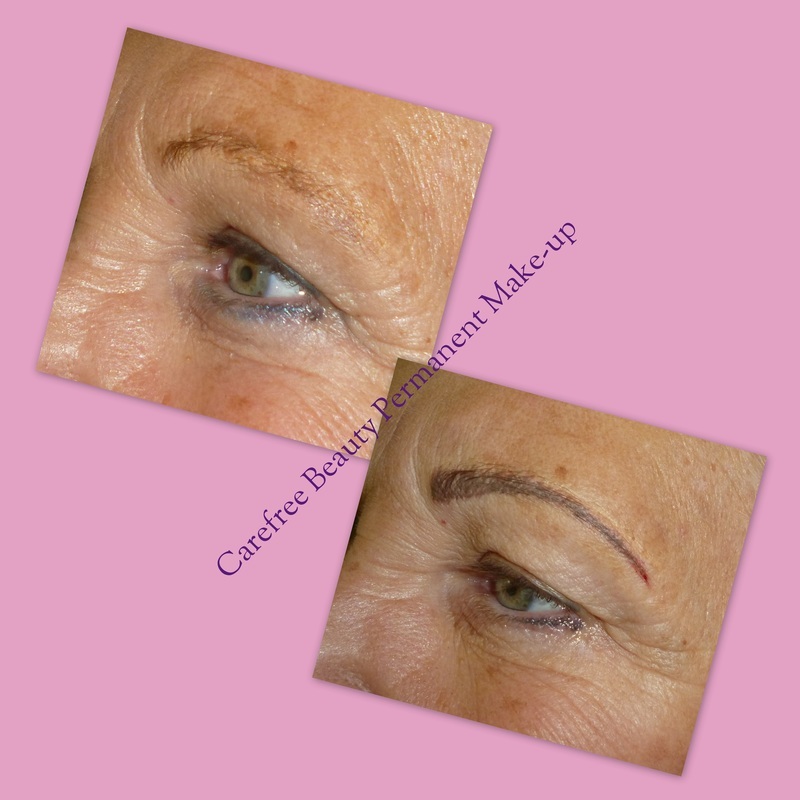 If you're thinking about having your brows done, you can find lots of information HERE. If you have other questions, please ask! My advice is always free & it would be great to hear from you. & hey presto,no more eyebrow pencils! 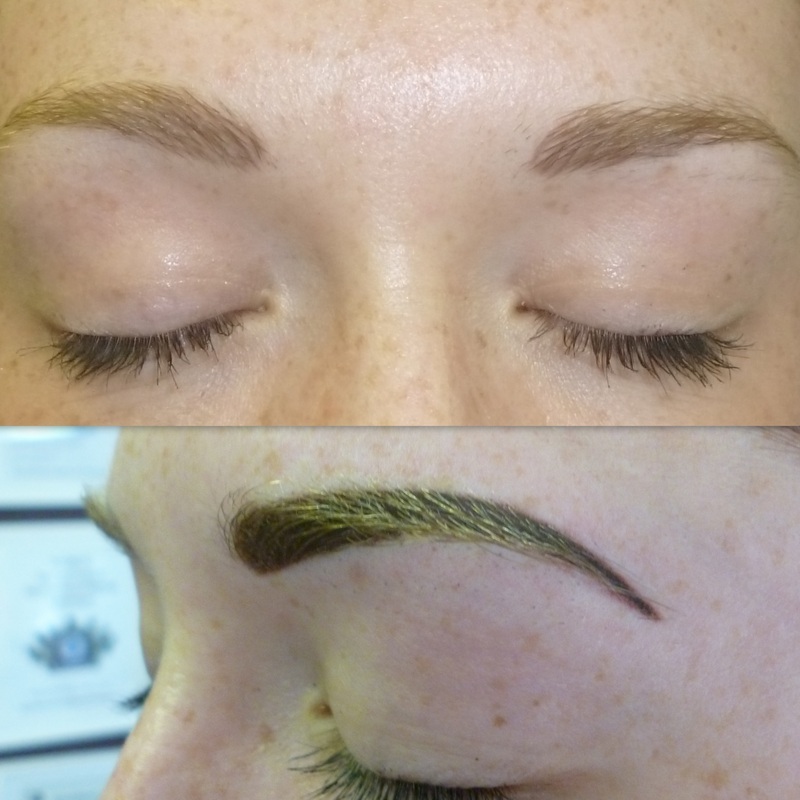 Lovely, natural looking result on a blonde-haired client who had very sparse brows ​of her own. Fair-haired client who had some colour left from a previous, unsatisfactory procedure. Corrected colour & shape - giving a much more flattering result. ​very natural result achieved from the off!! ​no brows of her own left. Before: No brows at all! 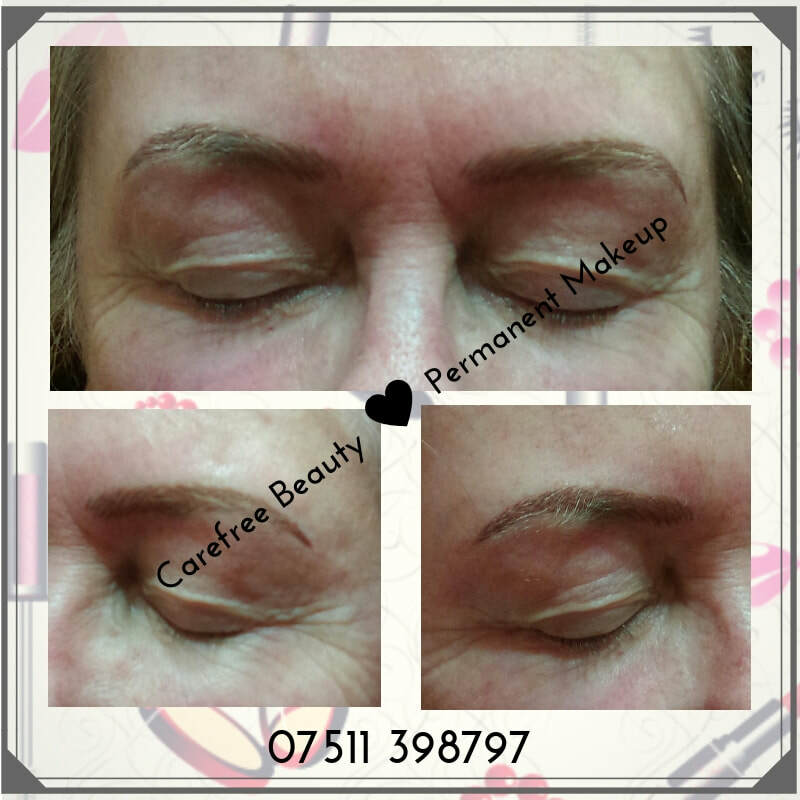 This client had some permanent makeup brows done a few years ago by another technician and there was a tiny remnant of colour left. 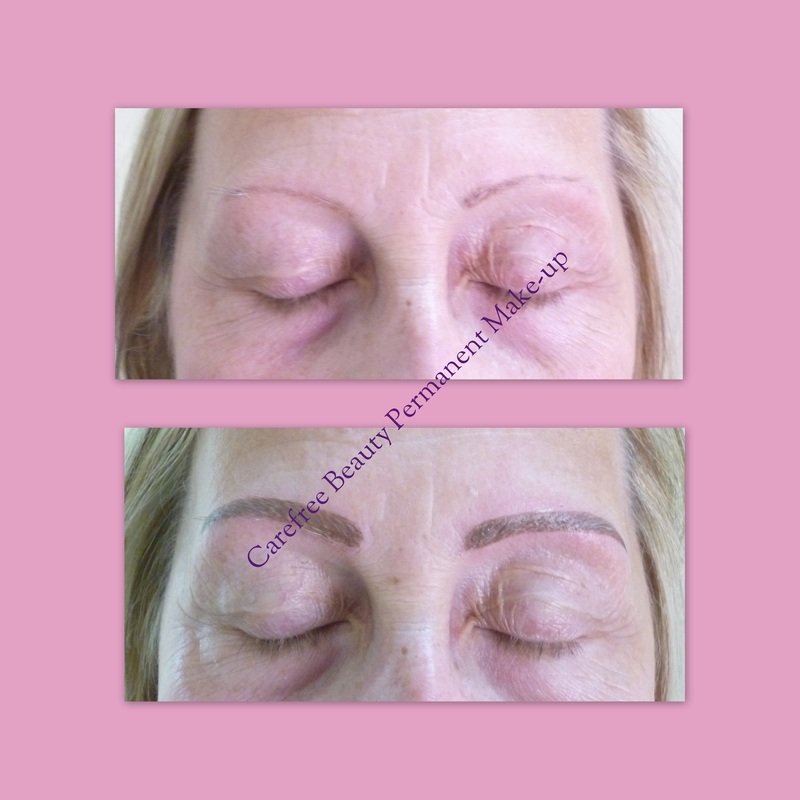 This lady still had some colour left from a previous procedure and her left brow was a bit darker than her right. Also, her right brow was now significantly lower than the other. In order to give them more symmetry, I had to make them both thicker. However, although they look a bit dramatic in this photo, which was taken immediately after her procedure, the healed effect after 4 weeks was really beautiful & the client was very happy. This client did have quite nicely-shaped eyebrows to start off with - see top photo - but notice how beautifully defined her eyebrows are after her Powder Brow Perfection procedure. The bottom photo was taken immediately after her treatment. As you can see, the colour is very intense but it will fade to a lighter shade after a few days. Complete healing will take around 4 weeks when the true colour will emerge. She will have a top-up appointment at this time, where we will check the colour etc. and make any adjustments, if necessary. 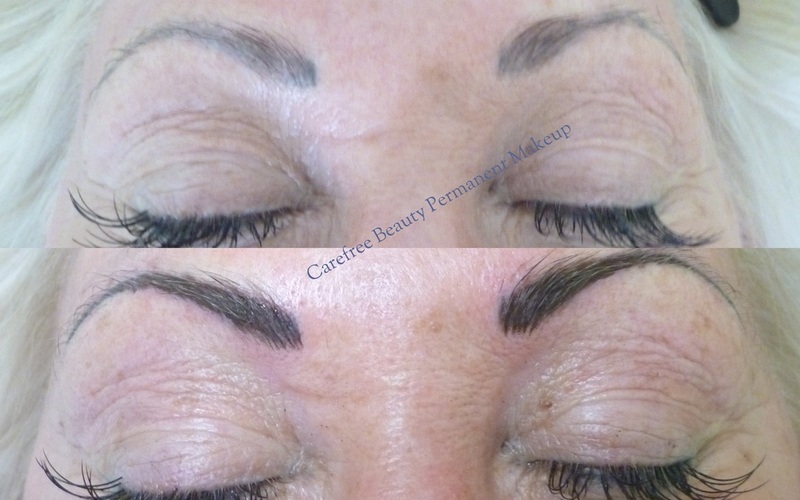 This client had her brows done previously by another technician. As you can see, they had faded to a blueish/grey colour. My client liked the shape of her brows but wanted them to be as dark as possible again, without being black, so I created a very dark brown pigment and went over the shape again for her, which she was really happy with. 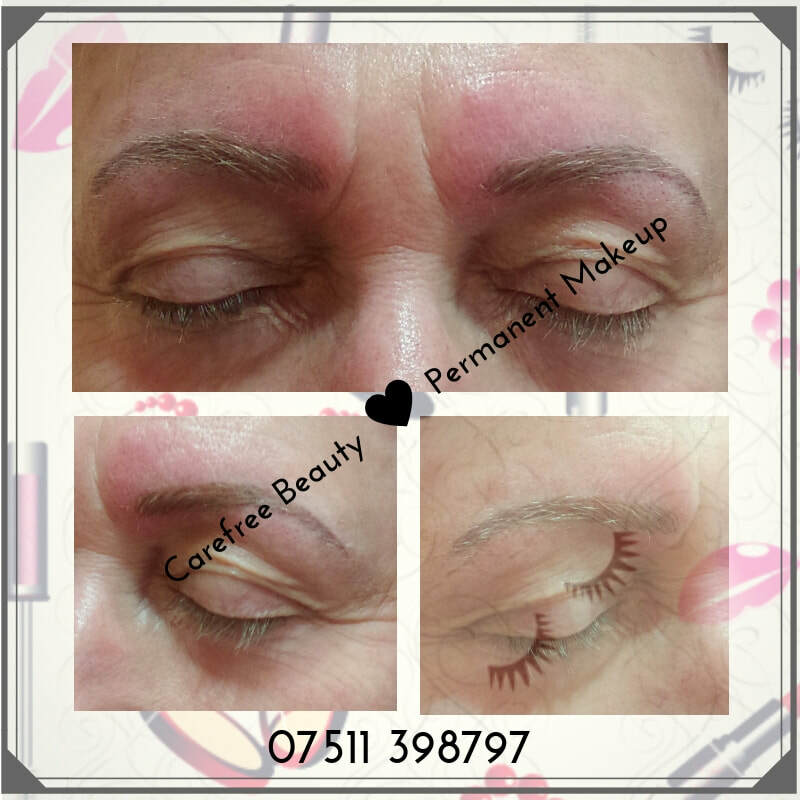 Unlike most clients, she'd like her brows to stay this intense colour but is aware they will fade over time and regular colour refreshers are the best way of maintaining the look she desires. She'll now have trouble-free brows for a good 12-18 mths & then come back to me for her colour refresher - perfect!! This lady had lost nearly all her brows and also, sadly, the sight in one eye was very poor, so she found it really difficult to apply eyebrow pencil properly. I used a mix of 3 pigments to create a shade of brown that complimented her red hair perfectly, and then I created a beautiful new set of natural hairstroke brows for her. 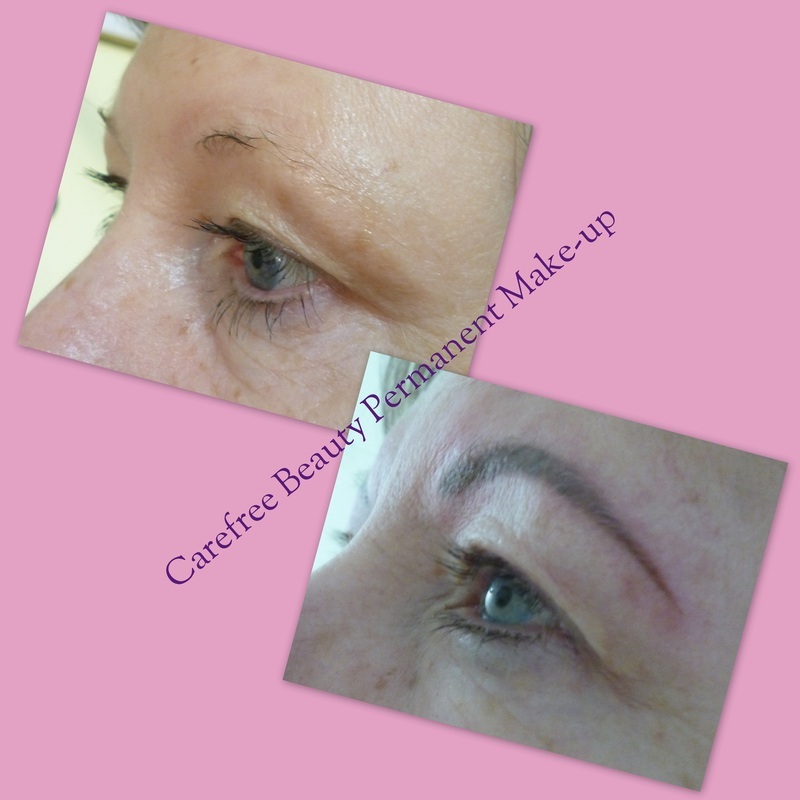 Perfect Model for Permanent Makeup! "It is always better to do less at the initial procedure, then add to it if necessary. Remember that my prices include all the touch-ups necessary...there is never any more to pay!" Many of my clients have had permanent makeup done before...this lady had her top & bottom eyeliner done previously but it had faded to a faint bluish line. I refreshed the whole eye for her - with a top medium & bottom fine eyeliner, using black & dark brown pigments, as she does like a very defined effect for her makeup. This lady wanted thick eyeliner top & bottom and was really pleased with the finished effect - no more eyeliner pencils!! 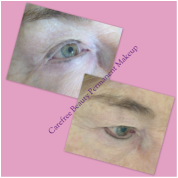 This client can't wear mascara and loves the convenience of having permanent eyeliner. She had her top & bottom eyeliner done by another technician 3 years ago and as you can see in the top pic, it had faded and become a touch bluish. The colour after the initial procedure is a bit dramatic but will fade to a lovely soft brown by the time she comes for her touch-up in 4 weeks time. 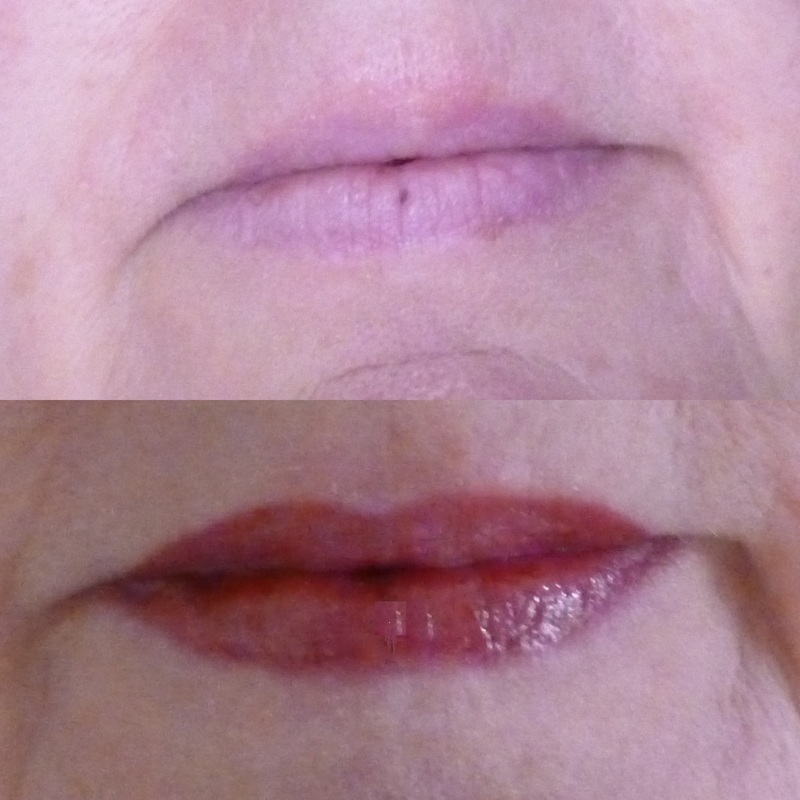 You can see from the top photo that this client already had a lovely regular lip shape. However, by "blushing" her lips, we created much more definition, even though the finished colour was still very natural. As you can see in the top photo, this client's natural lip colour has faded quite significantly and the outline of her lips has become less defined. However, what an amazing transformation there is between before and after the procedure! We decided on a beautiful, pinky brown lip colour to complement her lovely red hair, and all we did at the end was dab on a touch of nourishing lip balm. 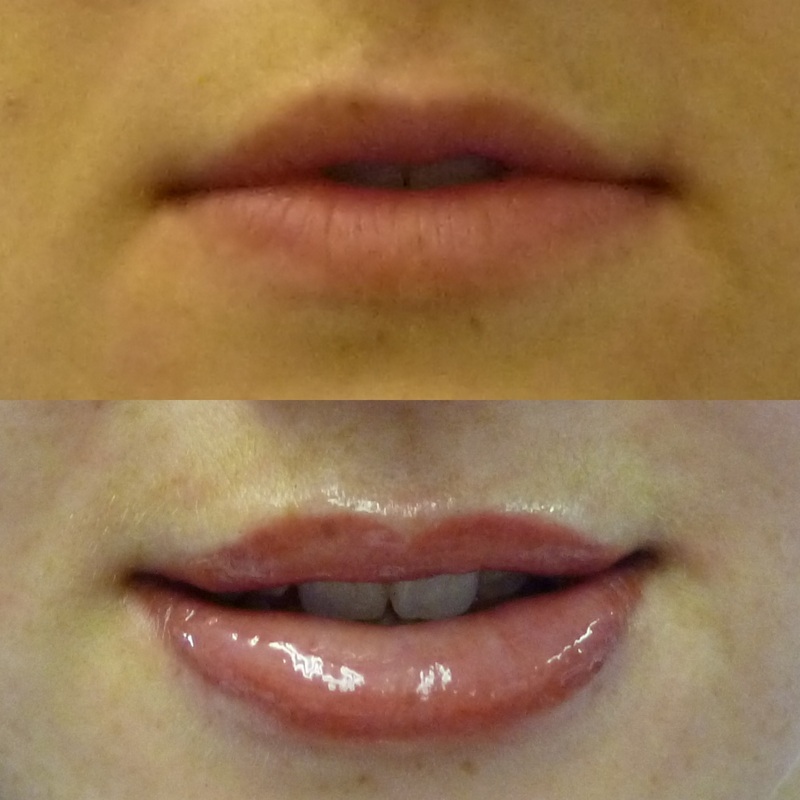 Even though the client's lips are still slightly blanched after the procedure, because the topical anaesthetic hasn't quite worn off, you can still see clearly in the bottom photo what a difference this lip blush procedure has made! NOTE: It isn't uncommon for the colour to fade by up to 70% after the first lip procedure. However, all adjustments are easily accomplished at the second stage of the process, during your 4-6-week top-up appointment. 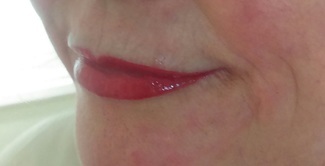 This client is much younger than in the above example but has still benefited by having her lips "blushed". She doesn't like wearing a lot of make-up, so wanted to go for a very subtle, natural look. As you can see in the bottom photo, the shape of her lips has been crisped up nicely and she will save so much time by not having to apply lipstick :) A dab of lip gloss will be perfect! NOTE: Her lips are still blanched straight after the procedure, because the topical anaesthetic hasn't quite worn off. 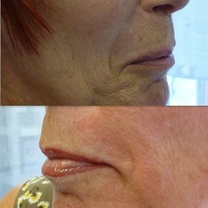 However, the anaesthetic will wear off very quickly and the true colour of the lip blush will show throughout her lips. 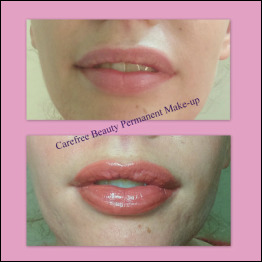 This client's natural lip colour has faded and the outline of her lips is not very well defined. She chose to have a full lip colour, rather than a lip blush. The bottom photo was taken half an hour after we had finished the first procedure, so the topical anaesthetic has worn off and there is hardly any blanching. As you can see, there is much more definition and fullness in her lips. - we have only added a touch of Vitamin A & D Healing Cream to aid the recovery process (an aftercare pack is included FREE with all our permanent make-up procedures). This initial colour is a few shades darker than the client desired but it will fade to a softer pink to give a lovely, natural tone back to this client's lips. Any necessary adjustments will be made during the touch-up appointment after 4-6 weeks. Often, with a full lip colour, a third visit is necessary. However, as with all Carefree Beauty permanent make-up procedures, there are no hidden extras - all necessary visits to complete the treatments are included in the price! Client wasn't happy with her lips that were naturally very pale. Permanent lip colour is perfect for this - go for the lip blush if you want a really natural effect, or the full lip colour if you want something a bit bolder.